ICAPs third and final 2016 Appraiser Update Seminar was held on August 1, 2016 at the Lisle, Illinois Sheraton Hotel. Opening the day’s event to more than 250 appraisers ICAP’s Immediate Past President Rick Hiton, IFAS introduced ICAPs current President Mike Morris, ARA, MAI. Rick presented Mike an award acknowledging his many years of volunteer service to ICAP, and his faithful and strong leadership during Mike’s presidency. President Morris introduced Mary Jane Lukas, ICAP’s administrative assistant. Mary Jane keeps the ICAP office organized and running smoothly. President Morris, on behalf of the ICAP Board of Directors, thanked Mary Jane for her professionalism and hard work in whatever task needs attention, and for attending to our memberships phone calls and inquiries. 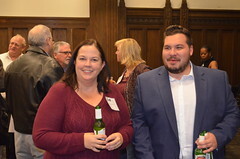 Mike extended a heartfelt thank you to the ICAP membership for attending ICAPs seminars and faithful contributions, and to the many Board members and committee members who volunteer their time working hard on behalf of the appraisal profession. Now on the governors desk for signature, ICAP’s Bill (HB3333) amends the Illinois Appraisal Management Company Registration Act to create an Appraisal Management Company Recovery Fund. President Morris stated the process for this bill began in 2015 under Rick Hiton’s presidency. Mike touched on other issues ICAP has addressed during the past year and reminded everyone that our website and exclusive membership ICAP Advantage Newsletter contain information about the issues ICAP continues to work on. ICAP membership includes appraisers in a variety of disciplines. 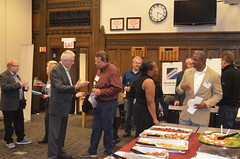 ICAP wishes to thank all of our speakers for their participation in ICAPs Lisle 2016 Illinois Appraisers Update Seminar and for providing an exceptionally good day of education, in a variety of topics, to all in attendance. All speakers provided time for Q & As at the end of their presentations. 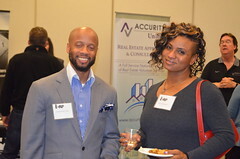 Many seminar attendees took advantage of the opportunity to ask these experts some insightful and pertinent questions. Thank you. Session highlights from the day follow. Scott DiBiasio, Appraisal Institute Manager, State & Industry Affairs, presented the opening session Federal & State Legislative Update. Representing 90 chapters and sponsor chapters of the Appraisal Institute, the 4-person Government Relations Office is based in Washington, D.C. Scott can be contacted via phone at 202-298-5593 or via email at sdibiasio@apprasialinstitute.org. 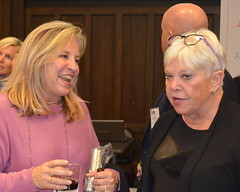 The presentation discussed the state of the Appraisal Profession, the decline in mostly residential appraisers, especially in rural areas, and the factors, such as uncertain business climate, economics, over‑regulation, alternative evaluations, and industry demographics, impacting on the Profession. The AF’s (Appraisal Foundation) current approach to appraising is their effort to turn appraising into a “cookbook type of science” rather than the art it is and has been. Mr. DiBiasio discussed the four major statutes specific to appraisers amended by the implementation six years ago of Dodd‑Frank. They include: TILA (Truth in Lending Act), FIRREA (Financial Institutions Reform, Recovery and Enforcement Act), ECOA (Equal Credit Opportunity Act), and RESPA (Real Estate Settlement Procedures Act). TILA topics included appraiser independence, reasonable C & R fees, HPMLs (High Priced Mortgage Loans) requirements, and qualified mandatory reporting. FIRREA addressed the Appraiser National Registry fees, AMC minimum requirements and State rules, and ASC policy regarding license reciprocity between States. ECOA includes a provision for the consumer to receive a copy of appraisals and other valuations three days prior to closing. Mr. DiBiasio also touched on the AMC registry fee for AMC appraiser panels, ICAPs submitted comment letter, appraisal De Minimis threshold levels currently under review, the bank regulators requirement to review regulations every ten (10) years, AVM quality control standard, OCC third party oversight, and the FHA Handbook 4000.1. Additional topics Mr. DiBiaso highlighted are key principles for modernization, federal regulation, State by State portability, uneven playing field, the joint letter by AVOA, AI, NAHB, TAF asking for oversight hearing, SAVE Act and Energy Bill issues, and State issues including evaluations and AO‑13, BPOs, appraisal review, and AMC related issues including background checks, recovery funds, and registry fees. Ray Brownfield ALC AFM, presented Agricultural Land Trends. Contact information for Mr. Brownfield of Land Pro LLC located in Oswego, Illinois is either by phone 630-258-4800 or email at ray@landprollc.us. Focused on agricultural and recreational land values, Mr. Brownfield asked the opening question, Where are we now? AG appraisers are needed. AG client types include estate planning, lawyers, farmers, not necessarily purchasers, litigation, right of way, and development planners. Land values increased 5 to 10 percent between the years 2000 to 2008. Ethanol standards were introduced. Ethanol is used in 40% of the U.S. oil. China entered the market. Good appreciation was seen in land. The 2012 drought was net in Illinois. Farmers had good insurance. A tremendous demand was seen in 2012-2013 with 15 to 20% increase in land values. In Illinois, the 2014 to 2015 period saw a drop depending on land quality. Land quality classes include Class A, Class B and Class C.
Included in the What we need to be watching discussion were commodity prices, demand, weather, domestic and global politics, interest rates and volatility. There is a big demand from China for ethanol; 40% of all corn produced goes to ethanol. Weather is something that cannot be controlled and will always be an issue in AG values. Low interest rates encourage land purchase and trade agreements, export policy and rates also affect AG values. Where are we going addressed current facts and market pressures. Typically, land investment is long term and can be a great investment. Investors purchasing land lease it back to farmers. Illinois is best suited for soy beans. Linkage includes two rivers, interstate transportation, and railroads. Rental markets capitalize land values and will decline in the future. As commodity prices improve, appreciation prices will decline. A 3.5% net, net, net after taxes NOI is desired. Investors real estate taxes have an impact. Mr. Brownfield advised appraisers to attend and observe auctions. Referred to as the appraisal of the day, they provide a great opportunity to see who the buyers are. A variety of audience questions included: Who are the investors, difference between AG and residential LTV ratios, the impact of wind farms on land value, types of approach used in land appraisals, and what is considered recreational land. Closing out the morning sessions John Urubek, MAI, CCIM presented Statistics & the Appraisal Process. Mr. Urubek commented that the “internet is here to stay. Click on it and someone is collecting your data. Sooner or later it becomes a statistic.” The purpose of the presentation is to encourage more use of statistics in your day to day appraisal practice, to expand your skill sets and experience by applying what you learn, and how to use examples of creative ways to create more credible reports. To solve the problem with confidence one needs a larger sample size. The focus of the talk is the applications of statistics in real world appraisal problems. Mr Urubek asked the question, “should I use statistics in my appraisal?” Appraisals refer to probability. USPAP SR1‑1(a) states an appraiser must: “be aware of, understand, and correctly employ those recognized methods and techniques that are necessary to produce a credible appraisal.” Through the use of four examples, Mr. Urubek provided creative and practical ways to use to statistics in the appraisal process. Definitions of “descriptive” and “inferential” statistics were presented. Mr. Urubek closed his presentation by reminding attendees that an appraisal must adhere to accepted appraisal principles, USPAP, laws and regulations, and assignment conditions. Mr. Urubek can be reached at phone 708‑557‑3662 or by email at jurubek@aol.com. For those in attendance expressing further interest in learning more about statistics and using them in their appraisal reports, Mr. Urubek teaches the class, Interpretation and Application of Simple Linear Regression. Contact Mr. Urubeck directly at jurubek@aol.com if you would like further information. 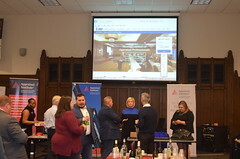 Their participation enhances the seminar program and provides attendees an opportunity to connect with your organizations on a personal level. Prior to the start of the afternoon sessions, an attendance optional panel discussion was presented by the American Society of Appraisers (ASA), one of ICAP’s four sponsor organizations. The topic: How to Expand your Appraisal Practice. 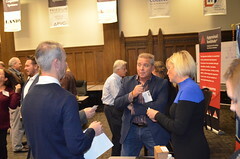 Alternatives to mortgage appraisal assignments were highlighted and included the following disciplines: Gift and estate planning, litigation, property tax appeals, personal property appraisal of machinery and equipment, and corporate valuation services for financial reporting, intellectual property financing, transaction advisory, corporate tax and risk management. 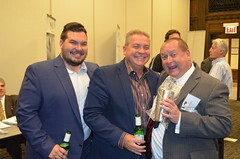 Andrew M. Raucci of Raucci & Sullivan Strategies, LLC was presented an award recognizing his long relationship with ICAP and the many years he spent lobbying the State Legislature on behalf ICAP sponsored bills and issues impacting the appraisal profession. Appropriately, James R. Blaydes, SRA presented Andy the award. 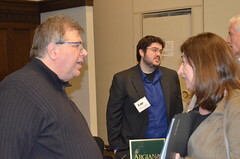 Jim, an ICAP past President and Legislative Chair, coordinated with Andy on ICAP legislative issues. 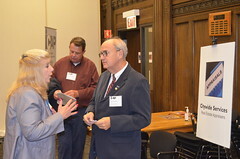 Jim donated many years of volunteer service to ICAP diligently working on behalf of Illinois appraisers and the issues impacting the profession. ICAP extends a heartfelt thank’s to both men. Kicking off the afternoon, Jack Friedman, PhD presented Advertising and Promotion of Expert Witness Services from an Expert’s Perspective. Mr. Friedman holds BBA, MBA, and PhD degrees and CPA, ABV, MAI, ASA, CRE designations. His company, Jack P. Friedman & Associates, is located in River Forest, Illinois. He can be contacted through his website http://www.realexperts.com. Mr. Friedman provided a wealth of information in a short period of time as to professionally managing your business. Mr. Friedman posed the question, Of the three things (sell the work, do the work, get paid) to do in your business, which is the easiest? Whether one is an expert witness or promoting professional services in general, Mr. Friedman stated it is necessary to gain visibility, be prepared to respond to any initial engagement request, and anticipate future events which could or does impact your service performance. It is important during the initial conversation to obtain details and resources pertaining to the case at hand including information about the attorney, and be fluent in describing your expert witness experiences. The appraiser must exercise due diligence in a number of areas, including but not limited to: Checking sources, establishing customer terms, availability, fees, inquire what sources referred them to you, resume content, Rule 26, engagement letters, rate sheets for a variety of circumstances, hourly rates based on your experience and education, reducing liability exposure, and the content and information one should include in their business cards, website, et cetera. Craig Capilla, Attorney with the Franklin Law Group presented “Lessons from Llano ‑ a Review and Reflection on Mass Litigation in the Appraisal Industry. Attorney Capilla’s contact information is via phone at 847‑716‑2380 or via email at ccapilla@charlesfranklinlaw.com. In 2010 Llano, Texas had a population of 3,232. In 2015 the number of suits filed by Llano exceeds more than the City of Llano’s population. So far multiple lawsuits have been filed in ten States, including Illinois. Forty claims were filed in Cook County, eight remain, in the U.S. Northern District, eight claims were filed, two remain, and in the U.S. Central District 100 claims were filed by First Mutual/Mutual First and 300 were filed by Llano/Carrington. There is a long string of entities involved in this litigation. They include: PayDirtReit, Heritage Pacific Financial, SAVANT Claims Management (SAVANTLG), Mutual First LLC/First Mutual Group LP, Llano Financing Group, and Impac Funding. Foreclosed properties were purchased for pennies on the dollar and resold at profit, charged off second mortgage loans were bought for pennies on the dollar and collecting on the debts was attempted. Attorney Capilla provided an in‑depth look at the history of the brothers Ganter, who are behind these lawsuits, and the entities involved in the various litigations across the States. Additionally, Attorney Capilla discussed the Discovery Rule. Illinois is a Discovery Rule state. 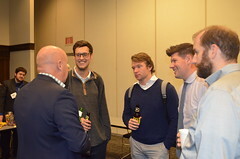 He offered some answers and guidance to the questions, “How do you attack this problem?” and “What should you do?” Appraisers were strongly urged to contact their insurance company, call an attorney, and if you belong to a professional organization, contact them too. Presented by Brian Weaver, the “Regulatory Update” session closed ICAPs Lisle 2016 Illinois Appraisers Update Seminar. Mr. Weaver is the Appraisal Coordinator and AMC Coordinator for the Illinois Department of Professional & Financial Regulation. Illinois is going paperless. Springfield needs an official email address from everyone. They would like two: a personal email and a business email address. A word of caution: Don’t let the State’s emails end up in your spam folder. Eventually every Illinois Appraiser License issued will include your photo on the card. Additional information can be found on the IDFPR website. The online Paperless Licensing Frequently Asked Questions can be found at the following link: http://www.idfpr.com/About/PaperlessFAQ.asp. A new issue of the IDFPR Illinois Appraisal newsletter is scheduled to be published in the fall. Read the most recent newsletter published in June, 2016, and check out previous newsletters online at: http://www.idfpr.com/DRE/ApprNewsletter.asp. Coordinator Weaver reminded the appraisers in attendance of two mandatory certifications required in appraisal reports. Effective as of June 1, 2015 per Section 1455.245 Scope of Property Conditions Inspections by Real Estate Appraisers requires the following statement, “The comments by the licensed real estate appraiser contained within this appraisal report on the condition of the property do not address “standards of practice” as defined in the Home Inspector License Act [225 ILCS 441] and 68 Ill. Adm. Code 1410 and are not to be considered a home inspection or home inspection report.” Effective April 1, 2013, Section 1455.250 Appraiser Responsibilities as relating to Appraisal Management Companies Section 15‑10 (a) fee disclosure requirement ONLY applies to the AMC client. Read the entire Section 1455.250 online at the following link: http://www.idfpr.com/profs/appraisal.asp. Coordinator Weaver provided a peek into future of AMCs and what it means for appraisers. The ASC Federal Registry Committee issued potential rules for $25 per panel member registry fee if the panel member completed a covered transaction within the previous 12 months. Coordinator Weaver mentioned there is one AMC which has 66,000 panel members nationwide, 55 jurisdictions will have to send checks to the federal registry, and States will be in a perpetual state of audit. Potential results is the AMCs will be forced to trim their panels, increase their fees to appraisers in order to cover the national registry fee, break up into smaller entities, sell themselves to a bank, or go out of business. The comments ASC received regarding AMC registry fees are posted and can be read at the following website: https://www.regulations.gov/docket?D=ASC‑2016‑0004. The states with AMC enforcement cases include New Mexico, Minnesota, and North Carolina. A word of caution to be informed about your client. Coordinator Weaver posed the question, What will Illinois need to do to comply with federal AMC regulations? Some things considered are: The need to rewrite the entire Act and Administrative Rules, register every AMC in order to identify who does not fit the federal definition, build or contract to have real-time panel uploads from AMCs, create an audit and compliance team just for AMCs, increase AMC application and renewal fees to cover costs, create a termination bond for the orderly liquidation of an AMCs wanting to close their business, and write an escape clause incase Dodd-Frank is repealed. Coordinator Weaver implored appraisers to stop signing indemnity clause statements. These are not for appraisers to sign, but for the vendor to sign. It is a prohibited activity under the Appraisal Management Company Act. Read the entire Prohibited Activities Section. See 225 ILCS 459/165, Section 165 Prohibited Activities (a) (7) (8). The Act can be found at the following link: http://ilga.gov/legislation/ilcs/ilcs2.asp?ChapterID=24 Refresh your memory, review the Appraisal Management Company Rules, specifically the sections covering payment policies and assignment guidelines. The link for these Sections (Sec. 1452.100 and Sec. 1452.120), the entire AMC Act and Rules can be located at: http://www.idfpr.com/profs/apprmanagement.asp. Coordinator Weaver reiterated troublesome issues in his “Stuff I Can’t Believe Still Goes On” portion of his presentation. ICAPs wishes to thank all the participants who attended our three Summer Update Seminars held in Collinsville, Springfield, and Lisle, Illinois. This year ICAP rolled out a new on-line survey, we thank all of you who took the time to complete the survey. Your feedback is important to us, and provides feedback as to how we can better serve you, our fellow appraiser professionals. We look forward to continuing to serve you and our collective profession in the years to come. Posted on August 15, 2016, in The Good Stuff. Bookmark the permalink. Leave a comment.